Have you found yourself wondering if God was ever going to answer your prayer? 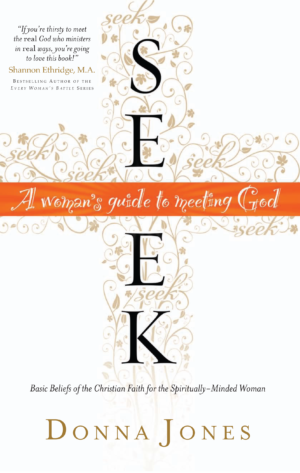 My friend, Author and Speaker Donna Jones, shares from her book — Seek: A Woman’s Guide to Meeting God — what happened when she and her family didn’t give up on a prayer request. Just over a year ago our family saw the answer to a prayer that took 40 years to answer. In case you skimmed right over that last sentence, let me repeat the time frame again—40 years. Not 40 minutes. Not 40 days. Not even 40 months. 40 years ago my brother-in-law became the first Christian in his family. After several years and a few awkward conversations, my husband followed his brother’s footsteps and became a believer, too. Together they began to pray for their mom and step-dad. When JP and I married, I joined in praying. Once our kids became old enough to question why Grandma and Grandpa didn’t believe in God, they prayed, too. There were seasons of intense prayer and seasons of scattered prayer. Was it discouraging at times? You bet. Respectfully, they stopped talking about God, but they never stopped praying. Or loving. Or visiting, or calling, or caring. About this time last year, my mother-in-law shocked us by announcing she was considering going to church “just to see.” We held our breath and continued to pray. She went and liked it. Several women invited her to lunch. These women were warm, thoughtful, even downright normal, and my mother-in-law liked them immediately. They invited her to join their home Bible study. She went “just to see.” She liked that, too. Why did it take 40 years of prayer before my mother-in-law made a spiritual commitment? Honestly, I have no idea. Sometimes we just don’t know why God works the way He does. What I do know is this: we’re glad we didn’t stop praying, even if it took years to see the answer. Maybe you’ve prayed for something—or someone— near and dear to your heart too, but have yet to see God answer. Perhaps you’re tempted to give up. You might even be toying with thoughts about how God doesn’t hear your prayers or care about your concerns. It’s easy to give up when we don’t see immediate results. And if people around us seem to have their prayers answered almost instantaneously? Well, it’s like adding salt to the wound. Unanswered prayer can make us feel invisible. The enemy would like nothing more than to sideline you and your prayers by tempting you to believe God doesn’t see you or hear you, and therefore, doesn’t care for you. But God does see. He does hear. You are not invisible. The cries of your heart do not go unnoticed. The eyes of the LORD search the whole earth in order to strengthen those whose hearts are fully committed to him (1 Chronicles 16:9). May I tenderly whisper something the devil doesn’t want you to hear? Keep on praying and don’t stop. Don’t let the enemy win. It’s easy to think of prayer as a one-stop deal. But Jesus so clearly indicates that prayer is an ongoing pursuit. Prayer is pressing in and pressing on, even when the pressure’s up. If you’ve been tempted to stop praying, don’t. If you’ve been tempted to stop caring, don’t do that either. When you are tempted to give up, look up. And pray. Even if it takes 40 years to see the answer. we will reap a harvest if we do not give up” (2 Thessalonians 3:13). Donna Jones is the author of Seek: A Woman’s Guide to Meeting God, Raising Kids with Good Manners, and Taming Your Family Zoo. A national and international speaker, Donna has spoken from coast to coast and on four continents helping women find and follow God in real, everyday life. Her favorite role is wife to her pastor/hubby, JP, and mom to their three wildly funny, young adult kids who frequently sit on her kitchen counter just to chat. For more encouragement and free resources connect with Donna at www.donnajones.org. on When God Seems To Take Forever to Answer Your Prayer. God has given me a vison for a non-profit organization dedicated to a number of ministries that are all intertwined. I am waiting on God to tell me who is to be involved and where the $$is coming from. Thank you, Lynne, for sharing with us what is on your heart and in your prayers. When God burdens our heart with something, I’m convinced He already has a plan for working through us to accomplish it. Keep me posted on what God does in His perfect timing and His perfect plan. Thank you, Juanita. Faith is truly the assurance of things hoped for, the conviction of things NOT SEEN. You remain in my prayers as you stand on God’s Word when it comes to your marriage. Keep persevering in prayer. I have been praying for a husband for over 20 years. In that 20 years I have jumped ahead of God and made my own choices soon to discover that the relationships were not of God’s work but my own. For the last 5 years I have been praying for God’s lead not my own and yet no man has surfaced, so I continue to pray for him, whomever he may be, and pray that God will bless me to be the best wife for him. I see God’s work in my heart and actions growing every day and know He is working in me. Sometimes I get so impatient and frustrated and want to take control again, but He is faithful to me so I will be faithful to Him. Thanks you for letting me verbalize this out loud. Thank you for expressing a very real frustration that I hear from many of my readers. Yet, I admire your wisdom in choosing to wait for God’s lead, trusting that He knows what is very best for you. I see so many women marry and then later regret rushing ahead of God. He truly knows how to fill the desires of your heart, with Himself, or with a man, once He knows He will be second to no one. 🙂 Thank you for sharing your heart. I love the insight you’ve learned in your waiting period, Garnet. I often say “when God says yes, He’s doing something for us, but when God says wait, He’s doing something IN us.” Your love and faithful prayers do not go unnoticed by your heavenly Father. I’m so glad you shared your heart today. You gave voice to many women who are in your shoes. Thank you! Hi I have been a Christian for about 37 years , raised both kids with faith as a lifestyle. Right now my prayers are for our adult son who is a recovering heroin addict and our adult daughter who walked out on her husband after 3 years of marriage. Its been very hard to keep praying and trusting for both of our kids. Oh Anita, I know that can be so discouraging. It was a huge comfort to me to realize, as I was raising my daughter, and still today, that God loves her even more than I do. And He desires her faith and obedience even more than I do. My prayer is that you will be a worry-free mom as you continue to persevere in prayer for your children. Blessings. I’m waiting on God to restore my marriage. We have been separated for a year and half now. I’m still praying and believing God’s promises. Thank you, Kelley, for sharing that with Donna and myself. 1 John 5:14-15 is the promise I am claiming for you today. We know it’s God’s will that marriages be restored so I’m praying He honors that one soon. Blessings, my friend. Cindi and I are praying along with you today, Kelley! I am praying that God will put me in a position so I can help young women who need a godly support system. I am also praying for a godly mate who loves the LORD supremely and loves me adoringly. Amen, Karen. Thank you for sharing that. God is clearly putting the desires of His heart onto yours. And that is when He delights in granting them (Psalm 37:4). Keep persevering in your prayers. I have been waiting and praying for my spouse. Don’t Get me wrong God Is Actually Blowing My Mind With Answered Prayer &Things I Haven’t Even Prayed For!!! So I’m Not Having An Issue Believing,Its The WAITING for What I Know IS Coming! I Feel Like That Commercial That Promises To Help Get Ur Settlement Quickly Folks Say” It My Money &I Want It Now” Because I Want Someone To Be Journeying & Doing Life With Me,Sharing With Me & Actually An Intimate Support Right NOW While I’m Experiencing These Awesome Opportunities.I’m Ready Now I Feel. But Obviously God’s Plan Isn’t Mine &His Timing Not Mine But I DO Trust Him So I’ll Just Wait ? Good to hear from you again, Shampayne. You keep waiting, girlfriend. Like you said, God is constantly blowing your mind with how He is coming through for you with what you haven’t even asked for. Surely He has something grand in store for you. Enjoy His blessings….the biggest one is that you have Him. Good afternoon!! I have been praying for a career in education. I adore our little children of the world and believe I can make a difference in many of their lives. Thanks for the encouraging story! Long-term prayers: salvation for sister; adult niece, nephews, and son. Freedom for family members from substance addictions… and 13 years a friend has suffered from autoimmune urticaria that causes constant 24-hr a day pain in her lower extremities… (feet feel like they are on fire). no cure – many various specialists sought out; toes are being amputated & consideration for legs being amputated now if her body can sustain and heal… – her issues are many… she is a mom that has rarely been outside of a dark; 60 degree room – she has missed out on much as her children have grown. How Long Oh Lord? How Long? Mercy! Mercy! Wow. So many needs. Yet God is a God who can HEAL so completely. I’m pausing to pray for those needs right now, Jean. Hi Cindi — thank you, and Donna, for this post. I was deeply touched by it as it brought out some past memories. I grew up with an alcoholic, abusive father, and my mother and I paid the price. I don’t believe my maternal grandmother ever stopped praying for us, and in college, I think God started trying to get my attention. I finally gave my life to Jesus in my 30’s. (Not quite 40 years…) My father was not a bad man, but he was lost in the effects of drinking. Because of God’s grace, I was able to forgive him, and I believe God will, too. Now, my son, raised in a Christian home, in his 20’s, has decided he’s an atheist. Well…the devil can’t have him. My husband and family are in prayer for him and my nephews and nieces every day, and we will not give up. You’re right — sometimes the prayers are a little raggedy, but they will continue. I know God hears, and I know He loves them all. Thank you, Larryn, for sharing your story and for your continued trust in your Heavenly Father who knows you, hears you, and sees you. I have prayed for Terry’s salvation since we were married in 1985. We divorced in 2010, and since that time I have added reconciliation to my prayer request. Donna’s story has encouraged me not to give up. ? I am waiting for happiness in my marriage, and for my husband to come back to God. Thanks, Kimberly. That is a prayer God hears. Don’t give up, my friend. I have been praying for both my sons to know Jesus. One is becoming curious-no pushing though-and one says he believes in karma, and that’s it! I do get my say in once in a while. And no pushing there either. So I am somewhat familiar with having to wait. Sharon, I once read in a book on prayer that sometimes it is more effective to talk to God about our kids, than to talk to our kids about God. This would be the case for that. Keep praying for their hearts. We’ve been praying for family members to be saved for decades. My mom passed away before seeing this happen and many of us are still waiting. It’s been more than 50 years, and this article encouraged me so much!! I will share this for others who need the same encouragement!!! I’m glad you were encouraged by it. Keep praying and thanks for sharing the post. My prayers today is to grow spiritually and allow God to be the center of my life. God finally healed me from depression after 15 years of just lying around wanting to die. He healed me and I no longer have depression. I live my life helping others to believe. Thank you, Brandi, for sharing how God has answered your prayer. I’m sure it will be an encouragement to others who struggle with depression. I am waiting for God to heal and restore my second Son’s heart that he will be free from sexual immorality,hatred, anger,fits of rage and drunkenness and other acts of a sinful nature.I am waiting for God to heal my family from the pain of the sudden lost of my Eldest son and for God to help us with our finances so that my sister can come home for good and be with us. I pray that God will help my family to grow spiritually and allow God to be the center of our lives. I’ve been waiting 41 years, so I guess there is still hope? I doubt it though. God has abandoned me and about 3 years ago, I think I finally convinced myself he doesn’t exist, and if he does, he is ignoring me. I’m not wasting anymore time praying, just to be disappointed yet again. A few weeks ago I began to question why I was still praying, and I think I’m done. I can’t take the disappointment anymore, it’s making me depressed and anxious. I keep believing He is going to help me, I get excited with anticipation that “today is the day” only to go to sleep, yet again, disappointed…..it’s been 41 years, enough is enough. You also didn’t say anything in your comment about having a relationship with the Lord…a love and obedience relationship with Him. It is through relationship that prayer becomes an exchange….a communication back and forth…not the asking or demanding or deciding if He is real based on whether or not He complies with your requests. God is not Santa Claus. He doesn’t exist to just give us what we ask for. He is wise and He is loving and He is good. Sometimes His “no” is for our own good but we can’t see it. And sometimes He waits until our desire is for HIM — not whatever He can give us. (See my blog this week on “How to Get What You’ve Always Wanted.” It is based on Psalm 37:4, “Delight yourself in the Lord and He will give you the desires of your heart.”) Too often we focus on our desires and forget that He must become our sole desire first.